Taking into consideration that the studies on the kinematics of the knee, based on an anatomic localization of the centre of instantaneous rotation, are hardly significant (Insall J.N., 1986, Chirurgia del ginocchio Verduci Editore), our study aimed to determine the tension put on the cruciate ligaments when the bending-stretching movement is imposed by an articulated joint with a fixed centre, or on the contrary, by an articulated joint with a variable centre of rotation.(KTJ©). In particular we have verified and compared the traction forces on the cruciate ligaments and the distance to which the two bone heads are constrained by the different movements imposed by the two articulated joints. A machine for passive gymnastics was used in the research. 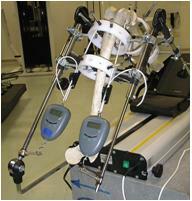 A series of tests were carried out using the original arm, which had an articulated joint with a fixed centre. The same measures were carried out with a modified arm: the fixed centre joint was substituted by a KTJ© articulated joint with a variable rotation radius. The articulation of the knee was reconstructed using a femur and a tibia fixed to the machine using 4 plastic rings (two for the femur and two for the tibia – a distal and a proximal) fitted with screws convergent at the centre in order to be able to clamp the respective bone segments in an exact spatial position. This enabled the femoral condyles and the flat tibials to be put in such a way as to perfectly re-establish the relation between them that they had during bending-stretching. This clamping system is a much more rigid system than that which you normally get when fixing a protector to the knee, since it does not create any area of elastic compensation determined by the soft parts of the leg and by the elasticity of the protector fabric. This system has been applied, however, to both cases described. Irrespective of the articulated joint used, it was always the machine which produced the movement and the type of articulated joint which imposed the trajectory of the knee. The alignment between the rotation centre of the machine and the initial centre of rotation of the knee, was determined according to Nietert's method (1976) and then corrected manually since this method did not provide for the centring to be personalized. The correction was made by acting on the screws on the plastic rings. The verification of the centring in all cases had to ensure that the bone heads remained perfectly in contact in the first 30°. The cruciate ligaments were “reconstructed”using 3 mm diameter Dacron thread and inserted through the perforated bone heads of movement. - the PCL from the rear tibial spine to the lateral face of the medial condyle in correspondence with the fossa where, in nature, the PCL is inserted. A small plastic tube was inserted into every channel formed by perforation, with an internal diameter just slightly bigger than that of the “ligament”, in such a way that the latter could always slide without creating chafing caused by the friction of the spongy material of the bone tissue and the strand-type material of the “ligament”. The ACL was fixed on the head of the tibia near the front exit hole, while the PCL was fixed on the head of the tibia near the rear exit hole. Both ligaments, after having passed the femoral condyles, were extended and fastened, at the base of the arm of the machine: a dynamometer was interposed, to measure the traction. To measure the distance between the articular heads, at every angle reached, a system of shims (0.1 mm) was used, to be threaded between the articular heads at various angles. The complete movement performed by the machine was 0° to 110°. The measurements were taken every 15°. All the measurements concerning distance and traction were carried out at the same time as the movement of the arm was clamped at the desired angle. As regards distance the results are reported in Fig. 1. As regards tension on the cruciate ligaments, we report in Fig 2 the results concerning the fixed centre while those concerning the KTJ© articulated joint are reported in Fig.3. For every single ligament, at the initial angle of 0° an initial tension of 1.00 kg was given in order to be able to establish any negative tensions. As can be seen in Fig. 1 the trajectory imposed by the articulated joint with a fixed centre determines a considerable deviation of the articular heads, from 30° bending and more. This does not happen with the KTJ© articulated joint which always maintains perfect contact with the articular heads. As far as the forces exerted on the cruciate ligaments are concerned, by analysing the data with the KTJ© articulated joint (Fig.3) we can observe that the ligaments are subjected to a traction (considerably less than that seen with the fixed centre) which, however, is equivalent, in counter-position, in every fraction of movement; furthermore the tractions are higher during stretching and in maximum bending, positions where the ACL, with the rear-lateral fascicle, and the PCL, with the front portion, have their maximum thickness (Insall 1986) and therefore degree of resistance to traction. The traction forces found with the articulated joint with a fixed centre, on the contrary, are decidedly asymmetric and of a higher intensity. The asymmetry is due to the fact that the PCL is initially tractioned, then left in the central phase of the movement and, at the end, in the last degrees it is tractioned again, even if only slightly. the articulated joint with a fixed centre does not give the rotational-translatory motion typical of the knee, thus creating a considerable distancing between the articular heads during bending-stretching, which totally agrees with what Insall reported (1986). The KTJ© articulated joint, on the other hand, gives a rotational-translatory motion which tends to maintain contact between the bone heads and develops very balanced tensions on the cruciate ligaments. Finally, taking into consideration what Insall reported (1986), about the possibility where the instantaneous centre of rotation does not fall perpendicular to the articular surfaces (or rather when a correct rotational-translatory movement is not performed), we know that “this condition can occur when the articular surfaces or the ligaments, or both, are not in their normal anatomic position, or when an immobilization apparatus or other orthopaedic device which forces the articular movement in an unnatural direction is applied to the knee”. With reference to the data reported, we can state that the KTJ© articulated joint offers a natural movement, very similar to the physiological one and, therefore, because of this, it is particularly suited for application on any machine which is used for rehabilitation, where any undue stress must be avoided which could further aggravate an already damaged situation. Subjecting a reconstructed ligament to traction with an excessive load is surely not the correct way to cure it. A reduction of this tension, maintaining perfect contact between the articular heads, also prevents the onset of strong tensions to the collateral ligaments, to the articular capsule and to the meniscus, (we must remember that the latter are connected to the articular capsule and the cruciate ligaments: PCL with the back cornu of the meniscus and ACL with the front cornu of the meniscus. The KTJ© articulated joint with a variable rotation centre can therefore be applied naturally on knee pads, on passive gymnastic machines and on machines for muscle reinforcement such as leg extension.